While cleaning out the 3rd bedroom the other day JL decided to take some photos of the notorious clown painting. This is a painting that used to absolutely freak me out when I went to visit JL when we were dating. The clown’s eyes follow you. Why you may ask do we keep the creepy painting? Well, the painting was made by JL’s grandpa and NHL is named for him. Here’s a sneak peak of why the painting is not allowed up in the house. 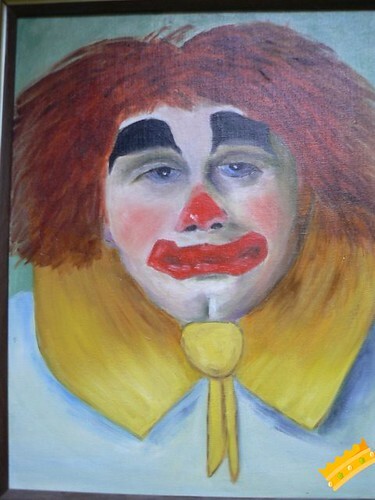 It seriously could cause a child to fear clowns: Remember the photo does not do this painting justice – it is MUCH worse in person. It kinda looks like Bush.